SmartSim running on the Raspberry Pi. 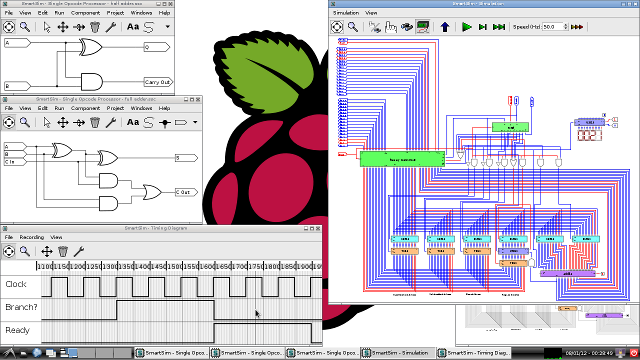 SmartSim is a free and open source digital logic circuit design and simulation package. SmartSim lets you create complex circuits by allowing you to create your own custom components and including them in other circuits, as if they were any other built-in component. These larger circuits can then also be included in other designs as sub-components. SmartSim also offers the ability to print out or export your circuit designs to PDF, PNG, or SVG. When you have finished designing your circuit, SmartSim offers an interactive simulation feature, allowing you to control your circuit and explore down inside hierarchical sub-components whilst the circuit is running. SmartSim also allows you to produce logic timing diagrams from your simulation's activity, which can then be exported to PDF, PNG, and SVG formats. SmartSim was developed by Ashley Newson, and is released under the GNU General Public License Version 3. Ashley won the Raspberry Pi Summer Coding Contest (14-18 category), a worldwide computer programming competition, for his development of SmartSim. See the full results here, and a BBC News technology article on the contest here. It is primarily intended for educational use by students and teachers, but is suitable for anyone, from children to adults alike, wanting to have a go at creating and simulating their own digital logic circuits. SmartSim is cross-platform, and is currently available to download for Windows and Linux computers, including the Raspberry Pi. Head to the downloads page. The Raspberry Pi Foundation is a fantastic organisation which is inspiring young kids to become the next generation of computer scientists, and aims to achieve this through the use of a $35 (about £25) credit card sized computer - the Raspberry Pi. The Raspberry Pi Foundation is actively helping to reshape computing education in schools. Read the Raspberry Pi SmartSim blog post. Visit the Raspberry Pi website.